This was the first charter that we did outside of Spain. On this particular occasion, we were two families; 4 adults and 3 children aged between 5 and 6 years old. Upon choosing our sailing destination, we thought about Central Greece, but because we wanted to go in the middle of August, we decided against it, due to the risk of the etesians meltemia—a strong northerly wind on the Aegean Sea which can last days. In the end, we concluded that a navigation route in Croatia would be the most ideal. 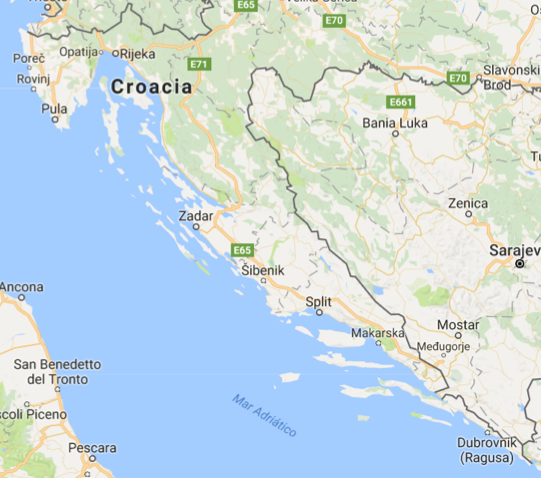 We then debated sailing in the south of Croatia, such as a navigation route near Dubrovnik and the surrounding islands, but ultimately we opted to rent a boat in the central zone of Croatia. This area has a large density of small incredible islands, which means that waves are not as big and you can easily find leeward refuge from any island. 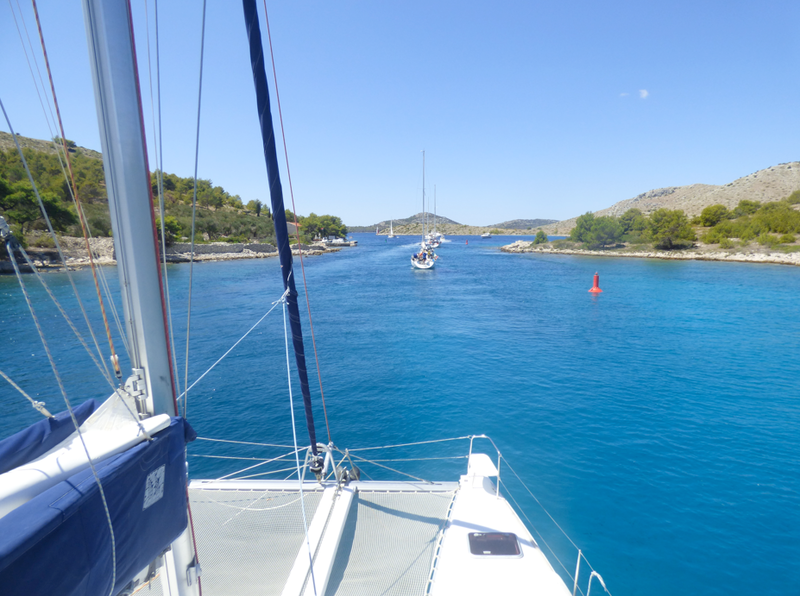 We departed from Marina Kornati, in Biograd na Moru, which is approximately 20 kilometers to the south-east of Zadar. As I have previously commented, up until now, we have always rented a sailboat in Ibiza, Mallorca, Menorca or Costa Brava. However, seeing as this time we were two families and three children, we opted for a catamaran as opposed to a sailboat. The two men in the group had experience navigating sailboats, but had never before rented a catamaran. We chose to rent a Lagoon 380 S2; a boat with fantastic habitability and the truth is that we hit the nail on the head. Sailing at 20 knots with such security that the kids could walk around the whole boat calmly and play on the net was a dream. On most occasions, we sailed at over 8 knots and sometimes even reached more than 9 knots. We booked the boat rental in December for 12 August, in order to benefit from the “Early Booking” discount. Apart from the almost compulsory auxiliaries and accessories, we also got a paddleboard as an “extra”. The adults loved and made as much use of the paddleboard as the kids! 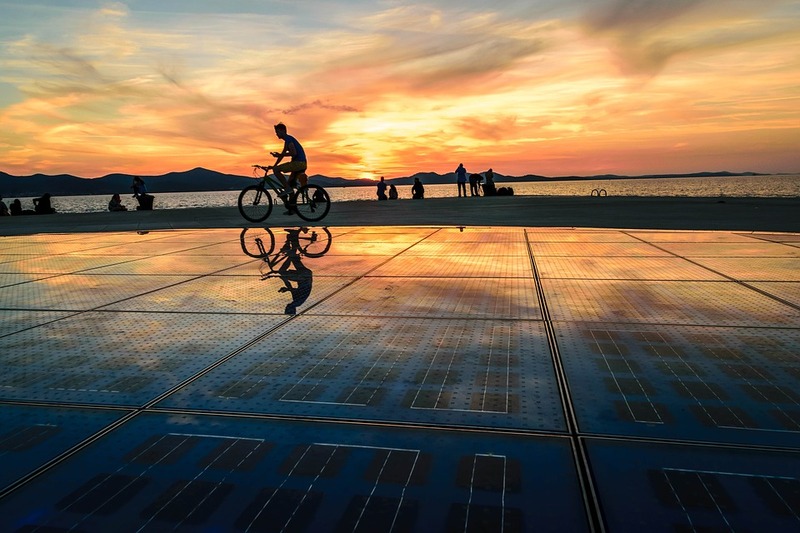 In order to plan our navigation route in Croatia, we first thought about how many hours we wanted to navigate daily. For us, four hours a day divided in two parts (two hours sailing in the morning and two more in the afternoon) was enough. Therefore, with a conservative calculation of 5-6 knots of velocity, and counting that out of the four hours, between moorings and small hiccups during navigation, your sailing time is reduced to three hours. We started the charter on Saturday afternoon and needed to be back in the port on the following Friday afternoon, as you must vacate the vessel on Saturday morning. This meant that in a week we could do about 100 nautical miles. In addition, we prefer to drop anchor as opposed to mooring in a harbor, so we only planned one halfway stop in a marina. Furthermore, we wanted a varied route so we decided to do something different: to sail upriver and visit some waterfalls. We left our things and suitcases on the boat and went into town for something to eat. After checking in and filling up on water, we cast off. As it was getting late and we weren’t too keen on anchoring for the first time in the dark, we planned a short trip to our first destination. 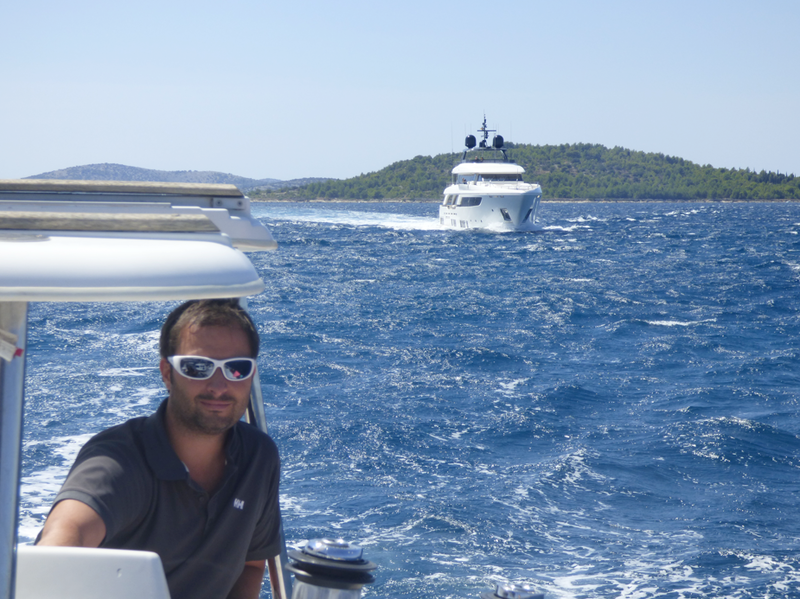 We departed the harbor and during the maneuver we discovered the beauty of having two motors. During these maneuvers, you completely forget about the rudder, leaving it to the procedure and controlling the boat with the gas levers. Except from moving sideways, you can do what you want with the boat, turning round is a children’s game. 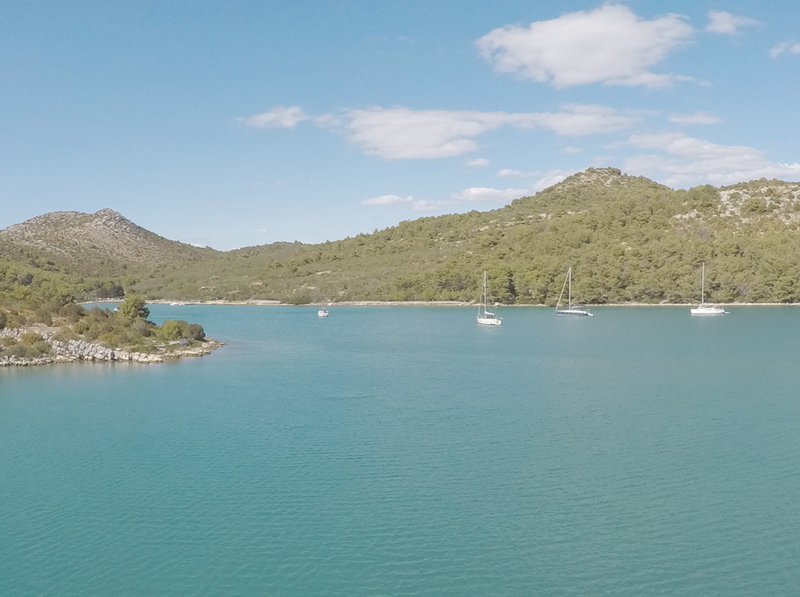 After 8 nautical miles, passing the south of the island Pašman and sailing back up to the south-western part of the island, past the tiny island of Otočić Lanđinić, we dropped anchor in Landin. A boat owner came and asked us to move back a bit from the area of buoys, so we did as he said meaning that on the first day, we anchored twice. By the second time, it was already night. Sunday was the day we entered the National Park. Our plan was to go deep into the bay of Telašćica past the two islands, Otočić Donji Školj and Otočić Gornji Školj. In order to do this, we had to do about 13 nautical miles and pass a narrow crossing. However, with the shallow draft of the catamaran, we did this happily and even better, easily. This place is beautiful and even though the vegetation isn’t incredibly luxuriant, you feel as if you are in paradise, yet without the crowds of other islands like Ibiza—bonus! Here, you can drop anchor literally anywhere you like and without any stress. The only things that didn’t appeal to us very much, was that the water wasn’t as transparent and anchoring between sand and mud. 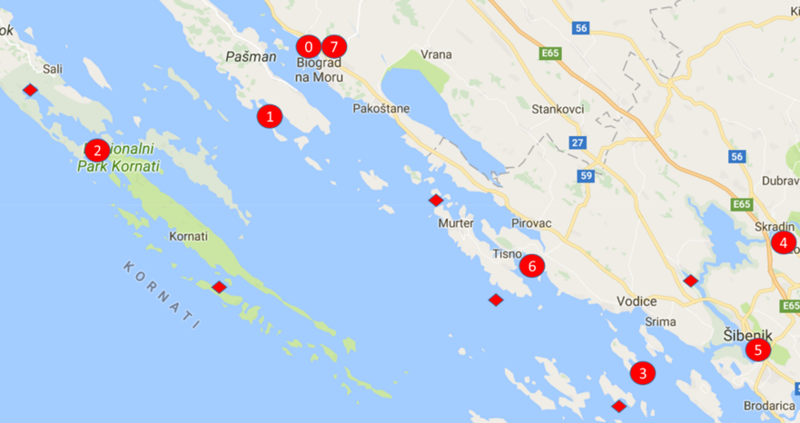 After eating and having a rest, we departed from the bay and dropped anchor just under 5 nautical miles later in Tomasovac on the island Kornat. We ate in a restaurant here called Konoba Suha Punta and the seafood was exquisite! On Monday we embarked on our descent towards the south-east, flanked by Kornat island to port (on the left side) and the islands to starboard (on the right side), in order to be more sheltered from the larger waves and wind. We sailed with the wind at 20 knots on the stern, alternating the navigation with the sails. Navigating was great. We sailed at 7-8 knots and calculated the sides and borders in order to dodge the islands and boats with priority of passage as if it were a slalom or regatta. 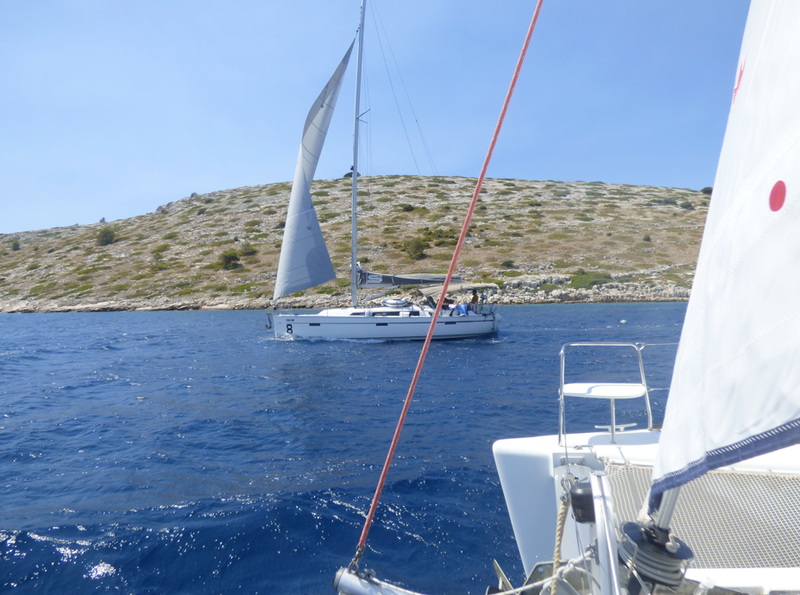 We anchored in Otok Lavsa to eat sheltered from the wind. The water was much more transparent here. 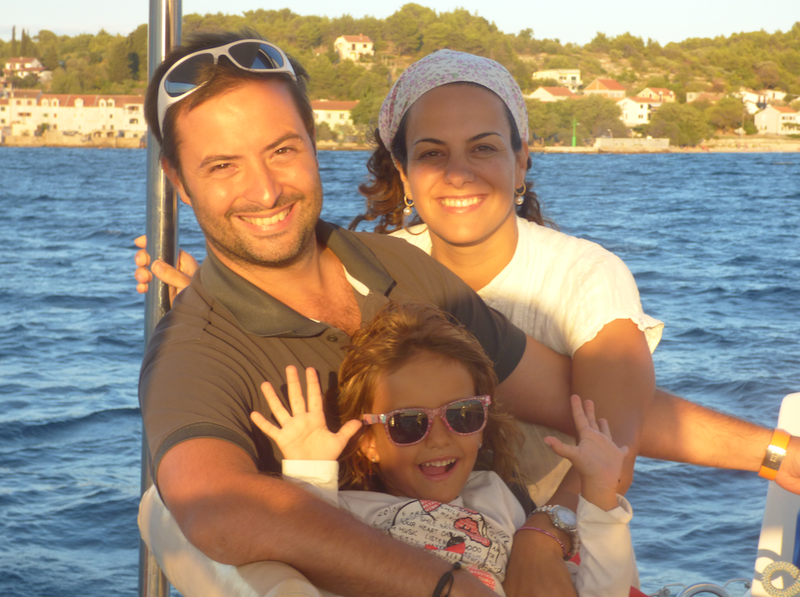 After weighing anchor, we set off for Otok Tijat, one of the islands near the mouth of the river Krka. There were many buoys and the cove was full—this was the first and only time we saw a cove so full during our charter. Though, we completely understood why, as the cove was incredibly beautiful. A boat owner told us that there was no problem with anchoring to ground (see photo below) in order to avoid swinging at anchor. In this cove there is a nice modern bar. On this day we sailed approximately 33 miles, above our average planned nautical mileage. After enjoying our morning in that spectacular cove, we went to the mouth of the river Krka and carried on upriver. Here, we began to appreciate the presence of large yachts, of which we hadn’t sited in abundance before. We navigated upriver, anchored and ate on the seafront of the small town Zaton, a little separated from the mooring zone. Everyone opted for a main course and decided against starters, though in the end fate landed us with a whole kilo of mussels and a couple of oysters per head! We stumbled upon a little hut where a very nice lad with his own fishing boat sold them to us. We also went under two bridges, which can always be a good laugh. After lunch, we went to Skradin Marina (ACI Marina Skradin), where we had reserved a berth for a night on the internet. 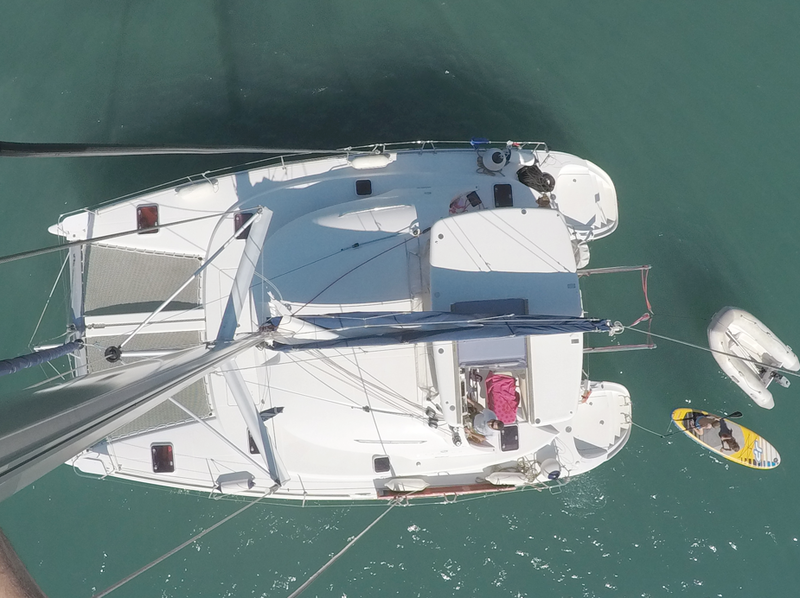 For a 38 foot catamaran, it cost us approximately 150 euros. 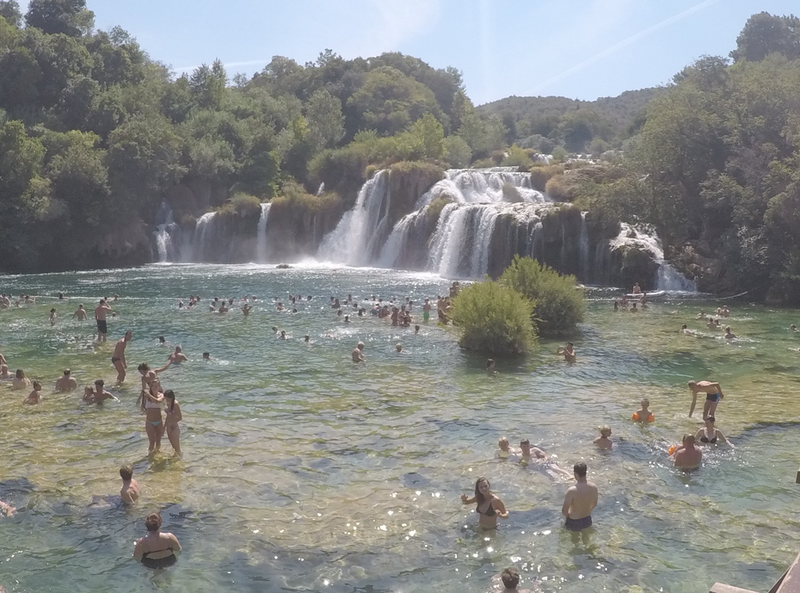 On Wednesday, it was time for our feet to touch firm ground and explore the Krka waterfalls. The waterfalls were stunning (though far from the beauty of Plitviče). I must admit, the amount of people there took away the charm a little. Basically, there are four options: walking (approx. 5 kilometers), by taxi, by boat (the option everyone chooses, but depending on the timetable you must queue to board the boat on the way there and back), and finally, the option we chose, by bike. I think going by bike is a great option for adults, but not so much for children. The first part of the route is on a road where there are no shoulders and in the second part, there are a couple of descents—which on the way back are difficult to cycle back uphill. Additionally, the boat was scheduled to leave the marina at 2 o’clock in the afternoon, so in the end, the other man in our group and I had to cycle back quickly to get the boat out of the marina, anchor it, and then return to eat. We ate a pasticada at the La Cantinetta restaurant and absolutely loved it. 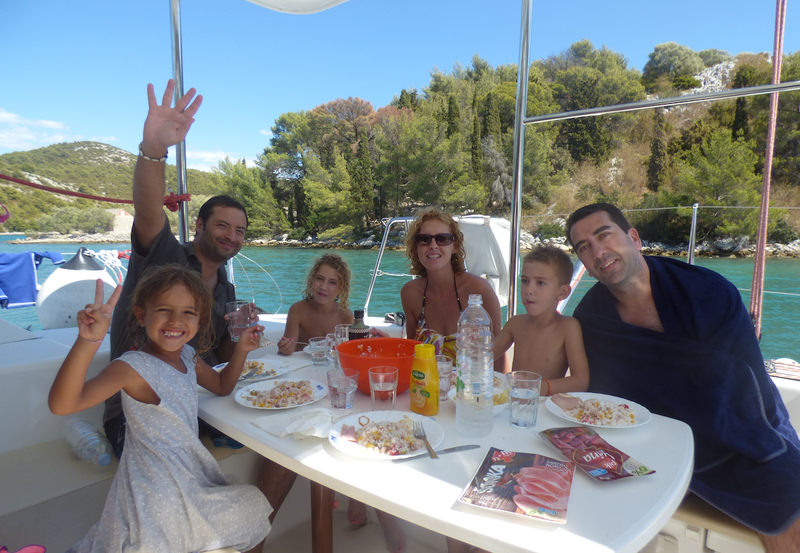 After lunch, we returned to our catamaran and sailed downriver to Šibenik. We moored on the seafront and enjoyed a very pleasant walk and lovely dinner. We decided to explore an island near the estuary, since we preferred swimming in the sea than in the river. 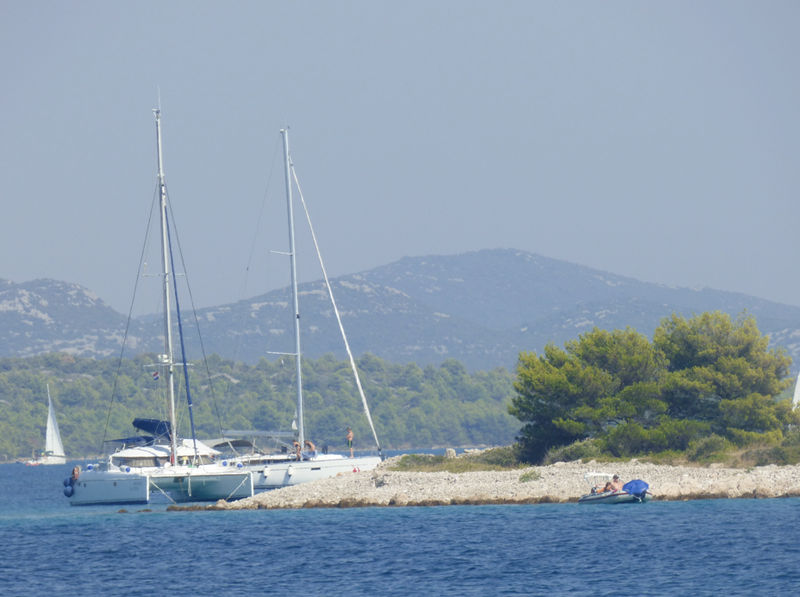 We arrived on the south of the island Otok Zmajan, between a cove and an islet where enjoyed snorkeling and diving. 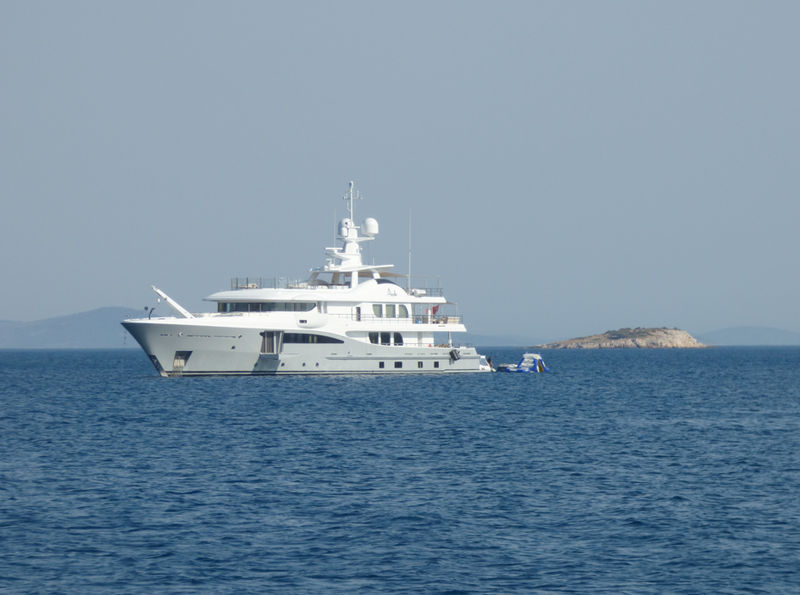 A large yacht had chosen the same spot as us and had an inflatable amusement park! 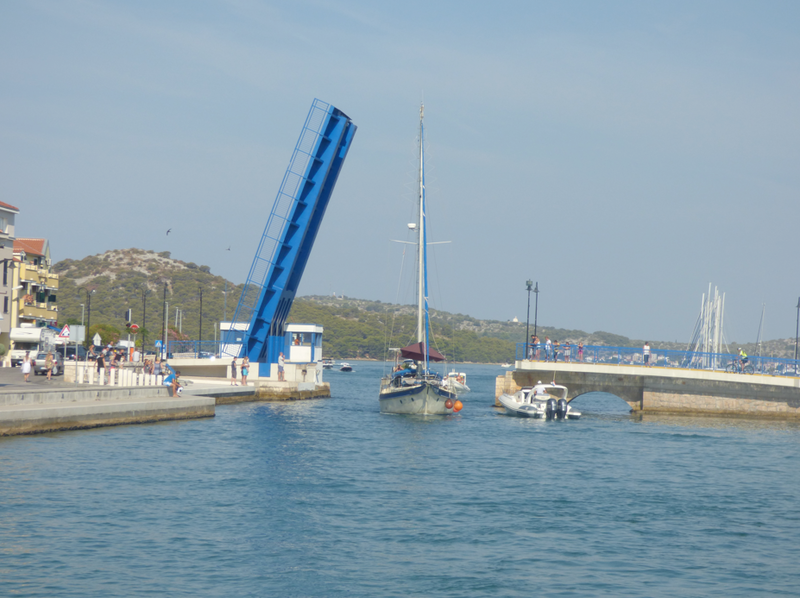 In the afternoon, we headed towards Tisno Bridge as I was excited to pass a drawbridge. Although the passing is tight-fitting (2 meters according to the navionics app and our catamaran 1.5m), so we decided to anchor nearby and check it out the following morning. We anchored in Gračina, a very beautiful cove if it were not for the fact that there was an outdoor disco. Highly recommendable if you are not sailing with children! On Friday, we had to return back to the base port for checkout, as even though you don’t have to leave the boat until Saturday morning, you are required to be in the port by Friday afternoon for them to check and revise the boat. We got up at 8.30am to be at the entrance of the bridge by 9am seeing as the bridge only opens two times a day: the first time at 9am and the second time at 5pm. As we approached the bridge, we noted how tight the passing was and decided not to risk it. We saw some motorboats and a classic sailboat pass through, most definitely with a shallow draft and well practiced at passing through the tight gap. Two other modern chartered sailboats and ourselves gave it a miss and turned around. On the journey back to base (Marina Kornati) we stopped for a while to snorkel in Otok Kukuljar. This place was without a doubt the best stop on the whole trip because of the water transparency and quantity of fish. After passing the island of Murter, we anchored between two little islands that we found to starboard, between Otočić Zminjak and Otok Radelj. We had our last meal and swim of the trip there. On the way back to the marina, just before entering we stopped to refuel in order to return the catamaran with a full tank. Checkout was smooth and all in all, this route is very recommendable for sailing with family and children. Need more sailing soutes and tips? Visit our destinations and routes page or our tips for sailors page on our blog! Thanks very much for the detail and photos- a great help in preparing my own route for July this year!